“Jo saan!” (Good Morning) and in walks my teacher jauntily into our brightly lit and tightly packed class. There are about 30 of us, from different backgrounds, speaking different languages, originating from different countries, and yet here we are together, assembled every Sunday morning for one common purpose, to achieve one common goal – to learn the language of 95% of the population in Hong Kong, Cantonese. During my previous stay in Hong Kong, i.e. before we moved to London, I was living a complete expat life – language included! I lived in Happy Valley which is an upper income residential locality with a good mix of Hong Kong natives and foreigners, where I could get away with using English coupled with a bit of actions and gestures. So when I did have some free time to learn something new I ended up learning Putonghua (Mandarin). However I barely got a chance to use this language and a few years down the line I have forgotten most of it. This time around though, my experience living in Hong Kong has been quite different. No more under the protective layer of an ‘expat’ package, we have learnt to live like locals. Matchbox apartments, travel by buses, shopping at wet markets, initially it was all a big change for me. I felt like a complete stranger in Hong Kong, frustrated with the fast-paced life, the ill-mannered people and the alien language. But as time progressed I started getting used to this other face of Hong Kong. This Hong Kong that doesn’t glow in the dark like one would see in most of Hong Kong tourist photographs. This HK where English becomes a tertiary language and where the quickest but the most difficult way to get oneself more acquainted with the surroundings is to learn the local language Guang dong wa (Cantonese), originating from their native land Guangdong province in Southern China. Well, I was taken aback for a while. I mean how many teachers or classes would try to scare away prospective students? But then I thought that this kind of an attitude conveyed a certain kind of dedication and sincerity on part of the teacher, who did not want his time or effort being wasted on students who were planning to leave the course half-way. There was a huge demand for this course and why not – at $2 an hour, it was almost-free, wasn’t it? I must say I just knew I was going to like my teacher! So with the kind permission of my dearest husband who agreed to look after both the boys on a Sunday morning, I enrolled for the class. The first class was a bit daunting as I wasn’t sure what to expect and at the same time I was feeling guilty leaving my family alone on a Sunday, how will they manage, what would they do? I think most home-makers like me tend to feel that life comes to a stand-still at home without their presence, that the family would be on tenterhooks waiting for the slightest movement at the front door, or for the phone to ring and for their mum to announce that she is own her way back home! Yippeeeeee! Unfortunately that is what we would like to believe but none of it is true! That first Sunday I came home to find three relaxed boys sprawled on the sofa, with their respective ”toys” and barely looked up when I walked in! Well that took care of the guilt, the rest of the time I just focussed all my attention on the class. My gut-feel about the teacher was spot-on. Not only does he have an excellent participative style of teaching, but he also knows how to keep us all alive and awake through the full three hour session. Whether it is though his loud exasperated voice when he berates someone for coming in late or his tones pitching up or down depending on the word or phrase being taught, his sense of humour keeps us entertained most of the time! In my first class, I wondered how telling each one of us our Chinese Zodiac signs and our future for this year through an astrology book, would help us learn Cantonese? “This is the Year of the Snake, Se lin” he started. By the time my turn had come, I was all eager to know about my animal sign and my future! “Waaaaah! Lou fu,” he exclaimed as he told me my sign meaning Tiger or Tigress. “Very dangerous la….” he exclaimed. The term “Lou fu” was also used as an expression for a bossy wife! “Your poor husband! he exclaimed. My husband who happens to be born in the Year of Rabbit was not helping my case as my teacher went on and on about bossy wives and Gong loi (Hong Kong girls)! He told me, reading from his book of fortune, what lay ahead this year for me. “Good year! Promotion, lots of money, love. But be careful aaa……lots of gossip from friends too, jealous friends, stay away!” I think I was looking perturbed when he quickly added “But you can help overcome the negatives by putting a bowl of water in the North part of the house and put something pink in colour in the East!” Now that would help, wouldn’t it? By the third class I started using some basic phrases practising with my security guard. “Lei ho ma?” (How are you?) “Hai-hai-a” (Yes, yes), Lei giu mat-ye maing-a?” (What is your name? ), “Au ge heui hawk hou” (We are going to school), Chi di gin (See you later)! “Yau sik sap fun jung” (Rest for 10 minutes) says my teacher when he gives us a short break in our three hour session. This is time to make new friends he would say leaving the classroom for us to look at each other oddly, thinking about what conversation to make. The majority of the students are Indians and would be so in the past as well as my teachers seems to be well versed with some of our customs and traditions. While he shared a piece of news about monkeys causing a menace in New Territories, he seemed absolutely certain that the ancestors of these menace making monkeys were brought to Hong Kong by the Indians! Maybe that is why they are so smart, he added! At the same time he did not forget to mention about the huge contribution of the Indians to a then fledgling Hong Kong in the early 1900s, when the University of HK was funded by an Indian Mr. H. Mody. The next majority are Filipino who want to learn this language to understand and communicate with their employers at home. We have a good mix of other nationalities like Sri Lankans, Australians, Singaporeans, English and single member teams representing Russia, Greece, New Zealand and even Switzerland. Within this mix we have a huge bunch of talent from singers, to dancers and also to actors! Some have been born and brought up in Hong Kong and yet can’t speak the language, some are doing it for work purposes, while a few like me are learning the language to get better settled. Besides the language, I have learnt some amazing things about the Chinese culture and traditions from our teacher who generally reserves a few minutes every session to share these interesting and informative pieces with us. Did you know that the Chinese like to ‘gift’ the deceased his/her favourite objects and comforts as part of the funeral process? If you ever visit an incense shop in Hong Kong, you will be surprised to see cardboard and paper models both big and small of various luxury goods like flat-screen televisions, sport cars, Gucci handbags, luxury boats, stacks of dollar notes, Patek Phillip watches and even a cardboard mansion! These pieces are really good art-work but ultimately meant to be burnt down which in my opinion is a big waste of talent and resources. However I am told that these are meant to give a comfortable after-life to the dead, in which case they could be worth every penny! I also learnt how superstitious the Chinese are, a trait similar to most Indians. There are good numbers, bad numbers, good days and bad days, depending on which weddings are planned, offices are opened for business and floors are numbered in buildings! Have you noticed the missing floor no. 4 in some buildings in Hong Kong? In some cases even 14, 24, 34, 44, and so on are all missing as the word ”sey” (four) in Chinese corresponds to the word “sei” meaning death! Again ”send clock” in Chinese means ”sung jung” which also means ”to go to a funeral,” so clocks are not the best gift items for Chinese, some might even take offence! We have also learnt some ”interesting” facts about certain areas in Hong Kong. Everyone knows about the old Kai Tak airport in Kowloon City, but does anyone know of the ”Naughty” hotels that exist in Kowloon Tong? Did you know that Bruce Lee’s house is converted into one such “Love” hotel? Fortune telling is quite popular with the Chinese. One can head to the local favourite temples like Che Kung Miu temple in Shatin and Wong Tai Sin temple in Wong Tai Sin, to know their future. In fact our teacher has very kindly agreed to take us on an excursion to Wong Tai Sin as part of a coming lesson! We have finished nine lessons so far and I am beginning to use my newly acquired skill wherever I can. My regular vegetable vendor in the local wet market, who speaks beautiful English, tries to help me out by conversing in Cantonese using simple phrases and telling me the prices in Cantonese too. “Gong maan-di, mm-goi” (Speak slowly) I tell him, going all pink in the face when I make embarrassing pronunciation mistakes, but most of the time he is quite patient with me. Taking taxis again offer a good chance to practice, specially while giving directions but it all depends on how encouraging the C-gay (driver) is or how well versed in English. It is funny when sometimes I keep trying to talk in Cantonese even while they would be talking in English! The other day I also got to use my Guang Dong wa in Wanchai street market while shopping for a pair of trousers. Asking for a bigger size, in a different colour was all understood by the shopkeeper in my halting Cantonese! I even tried bargaining after that just because I wanted to use this line “Peng di la…..thai gwai la!” (Make it cheaper….too expensive!) The shopkeeper was a very sweet man and did not shoo me off like the others, he said my Cantonese was “hou a hou a” (very good) and also rewarded me with a $2 discount – a very big deal in the low price Wanchai market! Mostly when I am not practising how to say things, I keep listening to other people’s conversations. Might not be too polite but then I can barely get the gist of the conversation. All I can do is get excited when I can pick up words or phrases used inbetween and I immediately translate it for my son or husband whoever happens to be next to me at the time! Another strange thing I have noticed and I am not sure if that happens with everyone, is that each time I try translating a word from English, the first answer that pops in my mind is its French equivalent! Growing up in Mumbai, I am fluent in English, Gujarati (mother tongue), Hindi (National language) and Marathi (State language). I took up French much later in secondary school and then continued it for a few more years at Alliance Francaise. I can’t say I am fluent in French, in fact I am nowhere close and yet out of all the languages I know, it is this secondary language that pops into my mind first! But then again when I teach my son Hindi at home, he talks to me about a similar thing, saying that when I ask him to translate an English word into Hindi, the Mandarin equivalent (he is learning Mandarin at school) comes straight to his mind first! Wonder what’s the logic here? Sometimes when I am writing a blog I tend to get so carried away describing each little detail, every little incident that I forget the purpose of writing the blog. 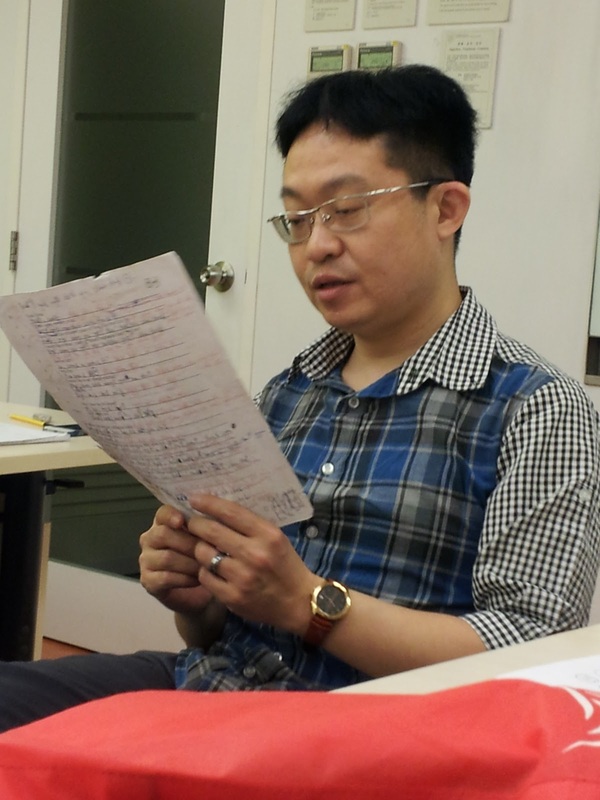 So, reminding myself about that very purpose I would like to say that I really like going for my Cantonese class. Besides having a very encouraging husband who has so far not let me miss a single class, I have a great teacher and a strong desire to learn something new, to do something different from what I do the whole week, to accept a new challenge and get ready to challenge others (soon hopefully!). I already feel a lot more confident of myself, a lot more comfortable with my surroundings, more acceptable of the local cultures and way of life and definitely well-settled.